In the age of real-time communications and instantaneity, we’ve grown used to wanting things, and wanting them now. Why buy the new season of Game of Thrones and wait around for it to be delivered tomorrow, when you can find it on demand and get it just now? Similarly, when it comes to engaging with brands, customers expect timely and contextualized messages that match the way they interact with them. But still too many brands fall short of implementing the communications their customers expect, or that will maximize the company’s ROI. In a recent study, Econsultancy noted that 28% of organisations cited technology as a barrier to optimize conversion rates. The same study showed that only 37% of respondents are already using behavioural emails, with an impressive 47% planning to use it in the near future. We know reaching the right customer at the right time cannot be a matter of luck, which is why a few months ago, we introduced Mailjet’s Email Automation, allowing you to codelessly automate the sending of an email, as soon as someone subscribes to a contact list. Today, we’re enhancing this feature to enable you to trigger automated workflows based on the update of contact properties. What does this mean, you ask? It means you’ll be able to reach your customers when it really matters. How? Read on! So, what can I do with behavioral emails? Using data from customer interactions with your brand is a good way to engage with your clients and prospects, but you’d better do it wisely or you could end up sounding a bit too creepy. I mean, getting nice reward for your loyalty is nice… but maybe getting an email after every single time you visit a website is a bit too much? Using the API to synchronize customer data after an interaction between your contacts and your brand is a good way of keeping track of interactions, to leverage them in your marketing strategy. For instance, while it wouldn’t make sense to send an email each time your clients earn a point in your loyalty program, it could be interesting to send them a communication when they’re about to reach the next loyalty level, to encourage the next purchase by focusing on them with extra benefits they’ll obtain, as an incentive. These are just some ideas, but there are unlimited ways you could leverage behavioral information to define new strategies that work for your company, and there is no doubt that one can meet your business needs. Thanks to Mailjet’s Email Automation tool, it’s never been easier to create behavioral emails. You first need to make sure that the data you want to use to trigger your automated emails is updated on a regular basis, either thanks to our API or through periodic imports of CSV files. Head out to Mailjet’s automation tab, available for all Mailjet’s Premium users, and select the brand new “Contact Property Update” scenario. As with other automation scenarios, you will then be able to define some basic information, like the title of the workflow or the language of the emails, and define whether you’d like it to only apply to contacts in a specific list, or even a segment. So, practical example: let’s imagine we’re an e-commerce and that, after each purchase, our customers collect loyalty points. When they reach 200 points, our loyal clients are awarded the Gold status, and we want to send them two emails (one to give them a special offer, and another one to explain them the benefits of the Gold membership). In this first step, we will name our workflow “Gold Membership” and apply it to all contacts. OK, so far so good? Let’s move on to the serious stuff. In the next step we will edit the workflow itself. A drop-down menu will allow you to choose the contact property that will trigger the emails. Depending on the type of data the contact property you select involves, you will be prompted to choose between several options of logical operator. You will then be able to define the value that will trigger the action. In our example, we choose the contact property “Points” and we specify “equals or greater than 200”, and then click Save. Once all of this is done, you’ll be able to add one or several emails to your automation flow, and set delays between those emails as we previously explained. Following our previous example, we would send one email right away with a special offer, and a second email two days later to explain the benefits of being a Gold customer. Et voilà! Creating behavioral emails with Mailjet really is a piece of cake. And, ‘cause you know, we love making your life easier, we can’t wait to hear how you’re using this new automation scenario to interact with your clients at the right time. The contact property update scenario is available as of today for all Mailjet Premium clients. Create an account for free to discover it during our 30-days free Premium trial, or upgrade to a Premium Plan now. If you are wondering whether you have to do some automation check out our marketing automation guide. Tried it? Love it? We’d be more than happy to hear how you’re making the most of these new features. So if these improvements have changed your life, share your story with us on Twitter. ? August is the perfect month to prepare for Back to School and sharpen your marketing efforts for the busy time ahead, that period that starts with us being all blue about going back to work and leads us all they way through to the Holiday season. Getting creative about our new campaigns is one of those things that needs to be done at this point in the year, but that’s not it. It’s also the perfect time to catch-up with upcoming changes that are going to take place in the inbox, and this year we bring you one that will change the way our contacts engage with our email campaigns. No one wants to let subscribers go, especially after putting in some hard work to get them to sign up to you contact list. However, sometimes parting ways is the lesser of two evils. Making it hard for people to unsubscribe might lead to some unwelcomed spam complains. By law, it is mandatory to include in the body of your emails an unsubscribe link to let recipients opt-out of your communications. But there’s more to an email than just the body. A lot of information is carried away in the header part of message, which helps the email reach the inbox and be displayed in the most efficient way to the email client. List-Unsubscribe is a header option that is automatically added to every marketing email sent by Mailjet. If the recipient’s email client supports it, it provides a button to effortlessly opt-out of a mailing list. Major mailbox service providers support List-Unsubscribe by providing their users the ability to opt-out from emails in just one click, without having to read the message to find the unsubscribe link. Microsoft Outlook, Yahoo and Gmail have all joined the List-Unsubscribe club. In addition to the basic unsubscribe behavior, Gmail added some sophistication on top of that. For instance, when a contact tries to report a legitimate mass-email as spam, it suggests you first unsubscribe from the list before reporting the email as spam. Sounds better, doesn’t it? The upcoming Mail.app in iOS 10 will be released on iPhone and iPad this fall and it brings a major change for every email marketer. 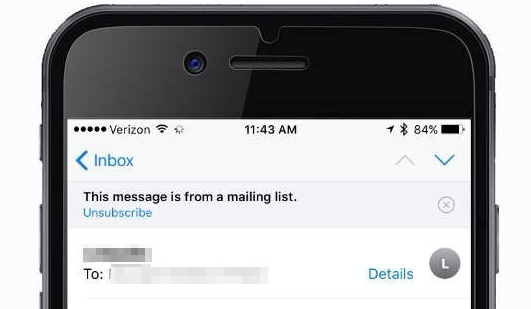 It will now use the List-Unsubscribe header to recognize whether the email was sent to a list and offer people the possibility to easily unsubscribe from your email list. What does it change for you as an email sender? If you are reading this blog on a regular basis, chances are that it won’t impact you a lot. If you are not carefully following email marketing best practices, it’s time to review your email marketing strategy to avoid a peak in your unsubscribe rate when users massively adopt iOS 10 on their iPhone or tablet. Tell us about your unsubscribe horror stories or how you plan to address the latest change in the inbox by tweeting us @Mailjet using the #MailjetUnsubscribe. Segmentation is one of the basics of a good marketing strategy. While we introduced some enhancements a few months ago, we thought there was still room for improvement. We received feedback from some users, frustrated for not being able to achieve the level of targeting they were aiming for, or comments saying that the way segments were managed did not fit some companies’ workflows. We heard you, and we are excited to introduce a new logical operator and a re-design segment management dashboard. API users were able to easily segment using the OR logical operator to send, for instance, an offer to VIP Gold customers in NYC or San Francisco. However, there was no simple way to do so using our web interface. Now, you can use the OR logical operator to create a segment that gathers several alternative values for the same contact property. You can combine two or more groups of conditions to come up with a finely-tuned segmentation that meets your business needs. In our example, we are creating a first block of condition where we select “New York City” and “San Francisco” as the”City”, and “Gold” as the “VIP Status”. Being able to refine the target audience of a campaign during the campaign creation process is something our users really value. But it doesn’t fit the organisational workflow of every company we work with. We received increased feedback from businesses where the people in charge of targeting and campaign creation are not the same, and where our current setup forced them to draft campaigns just to be able to segment their contacts. Segments is now a sub-entry on the Contacts menu, along with your Contacts, Contacts Properties and Subscription Widgets. All your previously created segments can be accessed in your account and you can easily identify the applied filter and the last time the segment was used. You can also edit, duplicate or delete a segment. We created a new segment edition screen, to allow you to create and edit segments without having to create a campaign. This new interface lets you recalculate the results of your targeting as you create your filters. It also gives you a better sense of who your targets are, with an extract of 5 contacts to match your query. Your can now create Mailjet sub-accounts that only have access to your contacts, to allow targeting specialists to create segments. We think segmentation within the campaign creation process is still an enjoyable feature, so we’re not leaving it behind. We have aligned our interface so you can benefit from all the enhancements to our segmentation process. We are really excited to introduce the improvements to Segmentation, which is available as part of our additional premium features on each Mailjet plan. If you have any further ideas on how to make it even more relevant, don’t hesitate to get in touch! When we launched Passport, we designed amazing templates to showcase the power of the tool, and we invited you to unleash your creativity. We wanted to isolate light, good and easy to use basic templates from our rich and complex templates with lots of images. After discussing with our users and learning from how they would use these templates, we have changed our minds and we have decided to re-design our gallery. This new gallery of templates provides quick access to Mailjet’s ready-made templates, a gallery with your personalized templates or the option to create your own HTML email designs. We all make mistakes, and that’s fine. And sometimes we make the mistake of thinking something is a mistake when it’s actually not. Confusing, right? Long story short, we know there was a lot of frustration from users not being able to undo the last edits on their email. We got your message and we have worked on it, coming up with an “Undo” feature that you can use by pressing CTRL + Z (on Windows and Linux) or CMD + Z (on Mac). And because we know that with “Undo” comes the need to undo the undone, we also came up with a “Redo” option, easily used by pressing CTRL + SHIFT + Z (on Windows and Linux) or CMD + SHIFT + Z (on Mac). We’ve received a ton of good feedback on our color picker. It enables Mailjet users to choose the color that suits them most and allows them to customize their texts and graphical elements, without the constraints of a fixed color palette. But still, we know it can be time consuming to enter the same color codes several times while editing an email. We’ve just released a solution to this, our clever color picker. It will learn from the colors you are using within the email edition process and memorize the most common ones, making it really ease to go back to them in the future! Feel free to share your feedback with us, and tells us what we can do to make your Mailjet email experience easier! Do you feel like you’re opening your inbox on a daily basis to see transactional email that leaves something to be desired? Marketing email has come a long way in the past 30 years, but transactional email still has some catching up to do. We still receive countless text-only purchase confirmation emails, non-mobile-friendly shipping notifications with broken tracking buttons, or off-brand invoices. Why is this the case? Most of the time, transactional emails are sent through IT-managed systems, which makes it more challenging for marketers to edit because there isn’t a design editor or an easy way to upload HTML designs. With the launch of Passport for transactional email, both marketing and tech teams benefit from a one-stop-shop to create all their email templates. It’s never been easier to use the same template(s) to create both marketing and transactional emails. Not only does this ensure brand consistency across all messages, marketers can now create or edit transactional email templates with a few clicks of the mouse, saving on costly IT resources. Creating responsive email that renders properly across devices and email clients has been a big challenge for a very long time. There are so many rules to keep track of – it can take ages to code, test and troubleshoot. With Passport, it’s as easy as dragging and dropping. You can visualize your email in real-time as you build and see a preview of how the design renders across devices before it hits the inbox. Design better email in less time – you can even use template elements across marketing and transactional email campaigns for greater brand consistency. When drag and drop isn’t enough, Mailjet’s Templating Language gives you more advanced coding options. It allows you to create uniquely relevant emails by using content placeholders as well as advanced structures such as conditions and loops. You can also automatically adapt your email layout based on customer information or transactional data, which will allow you to manage several use cases in a single email template. Mailjet’s Templating Language can be used while on Passport by just adding a block in which to insert code to your email template. Transactional email is THE biggest player in the inbox, driving the highest open and click rates of all types of email. We want to help you claim every extra dollar or click-through you can by merging the marketing visuals with stellar transactional content. Passport for transactional enables you to do so, whether it is including a promotional offer or simply the reminder of your business’ key messages. We’re stoked to see what you create with Passport for Transactional! Drop us a line if you have any questions. Growing an email list organically is probably one of the biggest challenges email marketers face. Several things have to fall in line before a consumer is willing to share their email address. There has to be trust, a good incentive and it has to be easy to opt-in – each additional click means a drop off in sign ups. As far as trust and good incentives go, consumers are looking for content that is specifically valuable and relevant to them. Personalized content drives a 20% increase in sales. To help users face these challenges, we’re releasing today a brand new version of our subscription widget. We’ve re-designed from the ground up the way you build subscription forms. With the new widget, you will have the flexibility to design and collect a variety of contact information such as first and last names and location to supplement segmentation and personalization in your campaigns. Sky’s the limit! Our new subscription widget allows you to easily create opt-in forms, integrate them into your site(s) and automatically see your opt-ins added to your contact lists within your Mailjet account. All with little or no design and coding experience. A whopping 78% of consumers prefer to do business with brands that use personal information to make the shopping experience more relevant. But 53% of brands say that they wish for more customer information – many sharing that they have trouble collecting data. Customer data often gets lost across fragmented software solutions or lack of internal communication between teams. The subscription widget allows Mailjet users to collect a variety of customer information up front (first name, last name, birthday, mailing address etc.). You can even mark certain fields as mandatory – to strike the right balance between requesting information and making it easy for your users to sign up. All of the data is then automatically sorted and synced with your Mailjet contact list. Collecting this data at the beginning of your touch point with customers allows you to build deeper demographic testing over time. Create as many subscription widgets as needed and test their performance across your sites. The subscription widget’s intuitive drag-and-drop editor allows customize your forms with a few clicks of the mouse. Edit the layout, text, image, and color scheme order to fit your brand’s visual aesthetic. When you’ve landed on a design you’d like to use, the tool will generate an HTML code to be copy and pasted into your website’s source code. For those looking to go beyond the surface, our advanced-edition mode allows power users to edit with HTML and CSS to create a subscription form that is seamlessly integrated with their site. All contacts who sign up through the subscription widget are automatically run through a native double opt-in. This industry best practice is when a new subscriber is sent a confirmation email before being added to the list, to verify that their interest and their email address is correct. Confirmation email and landing page are also customizable to your brand image. This new subscription widget is available as of today for all our users. We’re looking forward to see all of the exciting and creative ways you’ll use this to build your lists. Here at Mailjet, we strongly believe that good email marketing comes from knowing and listening to your customers. We work tirelessly on building new ways for you to stay ahead of the curve and deliver top notch content. Today, we’re excited to announce that we’re rolling out new Segmentation tools that will allow you to slice and dice customer groups with deeper insights. You will be able to segment contact lists based on historical activity such as opens and clicks. This feature is available for Premium users, as part of our continued initiative to build out a more flexible Segmentation experience. Premium users currently also have the ability to segment sends based on customer demographic information they collect, such as gender, age, location or even past purchases. As a consumer, there’s nothing more frustrating than receiving daily updates that you don’t have the time to read. Sending too frequently can cause customers to become unengaged, but sending not frequently can also put them at risk of forgetting your brand. Either way, lack of customer engagement is a threat because quality of content is one indicator ISPs measure in determining sender reputation. Segmenting contacts by historical open or click activity, you can arrange campaigns to be sent with a custom cadence, depending on how frequently customers are likely to tune in. Easily identify inactive customers from within your Mailjet account. Segment email addresses that have not opened and/or clicked within a defined period and win them back with a re-engagement campaign. Remember, the definition of an inactive customer is different from industry to industry, product to product. You also have to factor into consideration your email program’s average engagement and what it means to engage. Continuing to message inactive contacts will not only hurt your sender reputation, but you are wasting time and money crafting email content that will go unrecognized. Currently, all users have access to a fully comprehensive dashboard to track the performance of your sends. This gives peace of mind that your campaigns are sent, or allows you to troubleshoot if necessary. With this new update, you can combine several Contact Activity and Properties values to create a custom query of your liking. You can also save this segmentation for later use, on another campaign. We have backlogged behavioral data from April 9, 2015 onward. Try out these new segmentation features today or sign up for or upgrade to a Premium Plan and get started within minutes!